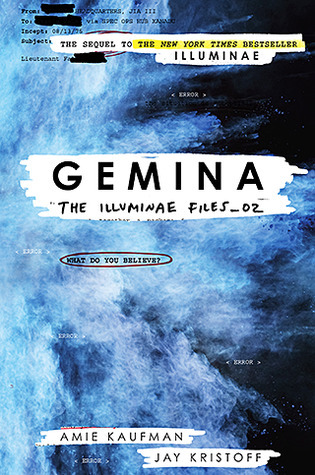 I don't know why it took me so long to actually pick up Gemina, seeing as I loved Illuminae, but boy was I in for a ride. Yet again, Kaufman and Kristoff sucked me back into the world and had me on edge for most of it. Originally I was kind of disappointed that the sequel to this series was going to be a companion novel because I miss Kady and Ezra so much! That didn't last very long though. Nik and Hanna are amazing individuals themselves - both sassy, hilarious and just genuinely likeable characters. They definitely did remind me of Kady and Ezra but it didn't feel like a character mould that the authors re-used in this secondary book. We're also introduced to Nik's cousin Ella who stole the spotlight for me. As much as I loved the two protagonists, Ella was super smart and witty, easily a character I would've wanted to become friends with in real life. The setup of Gemina follows that of Illuminae with IM chats, diagrams, transcripts and just every artsy thing that kept me interested. I think I lived for the IM chats between Nik and Hanna because it was such a creative way to convey how their relationship progressed and also a way to get to know them. I found that I was never lost, despite the pretty complex sci-fi references, because there was always a diagram or image that displayed what the text was trying to explain. Even with minimal text, the story was constantly action packed and intense. There were so many gripping moments and at the climax I was actually quite overwhelmed by emotion. I also liked that there were references back to Illuminae and events just seemed to make more sense or built up towards what could potentially happen if Heimdall and Hypatia ever met up. I do still think I love Illuminae (review here) just a bit more - more because it introduced me to the world and the characters. In saying that, Gemina is one of the rare sequels that live up to the expectations set by the initial book, and for that I would highly recommend anyone who hasn't started the series to do it. Now!